Photos of the Rene C. Davidson Alameda County Courthouse in Oakland, California. The Oakland courthouse, representative of WPA Moderne architecture, is the county's fifth. The Alameda County Courthouse was completed in 1936. All photos in this collection © Capitolshots Photography/TwoFiftyFour Photos, LLC, ALL RIGHTS RESERVED. Please contact Capitolshots Photography at info@capitolshots.com if interested in licensing any of the images in this collection. Photos of the Alpine County Courthouse in Markleeville, California. Designed by Frederick J. DeLongchamps, the Markleeville courthouse was completed in 1928. 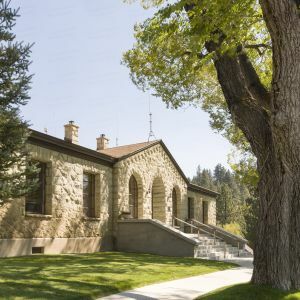 The Alpine County Courthouse, constructed of a light cream colored massive rhyolite tuff quarried from nearby Silver Mountain City, is listed on the National Register of Historic Places. All photos in this collection © Capitolshots Photography/TwoFiftyFour Photos, LLC, ALL RIGHTS RESERVED. Please contact Capitolshots Photography at info@capitolshots.com if interested in licensing any of the images in this collection. Photos of the Amador County Courthouse in Jackson, California. The Jackson courthouse was designed by Glass Architects. The Amador County Courthouse was completed in 2007. All photos in this collection © Capitolshots Photography/TwoFiftyFour Photos, LLC, ALL RIGHTS RESERVED. Please contact Capitolshots Photography at info@capitolshots.com if interested in licensing any of the images in this collection. Photos of the former Amador County Courthouse in Jackson, California. Originally constructed in 1863, the Jackson courthouse underwent extensive remodeling in 1940, led by architect George Sellon, resulting in the WPA Moderne structure. A new Amador County Courthouse opened in 2007. All photos in this collection © Capitolshots Photography/TwoFiftyFour Photos, LLC, ALL RIGHTS RESERVED. Please contact Capitolshots Photography at info@capitolshots.com if interested in licensing any of the images in this collection. Photos of the Calaveras County Courthouse in San Andreas, California. The San Andreas courthouse is part of the Calaveras County Government Center, which was built in 1966 and designed by Albert W. Kahl. All photos in this collection © Capitolshots Photography/TwoFiftyFour Photos, LLC, ALL RIGHTS RESERVED. Please contact Capitolshots Photography at info@capitolshots.com if interested in licensing any of the images in this collection. Photos of the El Dorado County Courthouse in Placerville, California. The Placerville courthouse, a Classical Revival structure designed by Clarence Cecil Cuff, was completed in 1912. The El Dorado County Courthouse later underwent a substantial renovation, leading to its rededication in 1971. All photos in this collection © Capitolshots Photography/TwoFiftyFour Photos, LLC, ALL RIGHTS RESERVED. Please contact Capitolshots Photography at info@capitolshots.com if interested in licensing any of the images in this collection. Photos of the Fresno County Courthouse in Fresno, California. Designed by Wagner And Associates, the Fresno courthouse reflects the influences of Edward Stone and Minoru Yamasaki. The Fresno County Courthouse was completed in 1966. All photos in this collection © Capitolshots Photography/TwoFiftyFour Photos, LLC, ALL RIGHTS RESERVED. Please contact Capitolshots Photography at info@capitolshots.com if interested in licensing any of the images in this collection. 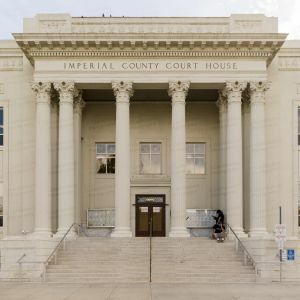 Photos of the Imperial County Courthouse in El Centro, California. The El Centro courthouse, a Beaux-Arts structure, was designed by Don W. Wells and Ralph Swearingen. The Imperial County Courthouse was built in 1924. All photos in this collection © Capitolshots Photography/TwoFiftyFour Photos, LLC, ALL RIGHTS RESERVED. Please contact Capitolshots Photography at info@capitolshots.com if interested in licensing any of the images in this collection. Photos of the Kern County Courthouse in Bakersfield, California. The Bakersfield courthouse, designed by Ernest L. McCoy, opened in 1959. 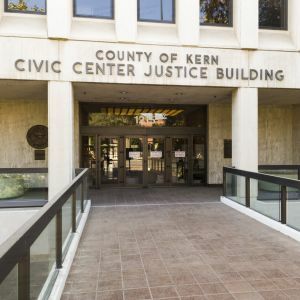 Minor cases continue to be held at the Kern County Courthouse, though the primary criminal and civil courts for the county have been relocated a block away to the Kern County Civic Center Justice Center, which opened in 1980. All photos in this collection © Capitolshots Photography/TwoFiftyFour Photos, LLC, ALL RIGHTS RESERVED. Please contact Capitolshots Photography at info@capitolshots.com if interested in licensing any of the images in this collection. Photos of the Kern County Civic Center Justice Building in Bakersfield, California. The Bakersfield courthouse, the primary courthouse for Kern County, was designed by Eddy Paynter Associates. The Kern County Civic Center Justice Building opened in 1980. All photos in this collection © Capitolshots Photography/TwoFiftyFour Photos, LLC, ALL RIGHTS RESERVED. Please contact Capitolshots Photography at info@capitolshots.com if interested in licensing any of the images in this collection. Photos of the historic Kings County Courthouse in Hanford, California. Designed by William Willcox with an eclectic mix of styles, the Hanford courthouse opened in 1896 and served as the county courthouse until a newer government center west of downtown opened in 1976. The historic Kings County Courthouse, which currently houses small retail offices and shops, is listed on the National Register of Historic Places. All photos in this collection © Capitolshots Photography, ALL RIGHTS RESERVED. Please contact Capitolshots Photography at 202.709.7273 or at info@capitolshots.com if interested in licensing any of the images in this collection. Photos of the Kings County Justice Center in Hanford, California. The Hanford courthouse, constructed in 1991, is one of many within the Kings County Government Center campus, which originally opened on the edge of town in the mid-1970s. All photos in this collection © Capitolshots Photography, ALL RIGHTS RESERVED. Please contact Capitolshots Photography at 202.709.7273 or at info@capitolshots.com if interested in licensing any of the images in this collection. Photos of the Los Angeles County Courthouse, also known as the Stanley Mosk Courthouse, in Los Angeles, California. Part of the Los Angeles Civic Center, the Los Angeles courthouse, designed by a team of architects, was completed in 1959. All photos in this collection © Capitolshots Photography, ALL RIGHTS RESERVED. Please contact Capitolshots Photography at 202.709.7273 or at info@capitolshots.com if interested in licensing any of the images in this collection. Photos of the Los Angeles County Criminal Courts Building, officially the Clara Shortridge Foltz Criminal Justice Center, in Los Angeles, California. Formerly known as the Los Angeles County Criminal Courts Building, the building was renamed for Foltz, the first female lawyer on the west coast of the United States, in 2002. The Los Angeles courthouse has hosted many high-profile trials over the years, most notably the O.J. Simpson murder trial in 1995. 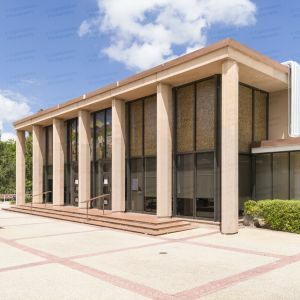 Designed by Adrian Wilson Associates, the modern courthouse was completed in 1972. All photos in this collection © Capitolshots Photography, ALL RIGHTS RESERVED. Please contact Capitolshots Photography at 202.709.7273 or at info@capitolshots.com if interested in licensing any of the images in this collection. Photos of the Los Angeles County Hall of Justice in Los Angeles, California. Designed by Allied Architects and built in 1925, the granite Los Angeles courthouse, a Beaux Arts structure, was vacated after sustaining substantial damage in the 1994 Northridge earthquake. The Los Angeles County Hall of Justice today stands vacant, though various plans for its renovation are under consideration. All photos in this collection © Capitolshots Photography, ALL RIGHTS RESERVED. Please contact Capitolshots Photography at 202.709.7273 or at info@capitolshots.com if interested in licensing any of the images in this collection. 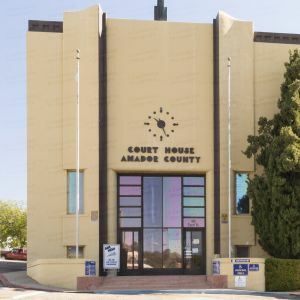 Photos of the Madera County Courthouse in Madera, California. Across the street from the 1902 historic Madera County Courthouse, the Madera courthouse was originally a school when purchased by the county and converted into a courthouse in 1955. The redesign was led by Charles D. James. All photos in this collection © Capitolshots Photography, ALL RIGHTS RESERVED. Please contact Capitolshots Photography at 202.709.7273 or at info@capitolshots.com if interested in licensing any of the images in this collection. Photos of the historic Madera County Courthouse, now the Madera County Museum, in Madera, California. Designed by Hugh Braunton and completed in 1902, the granite Classical Revival structure served as the Madera County Courthouse until 1953. The current county courthouse stands across the street. A 1906 fire destroyed the original clock tower, and the current clock tower differs in architectural style from the original. The Madera courthouse is listed on the National Register of Historic Places. All photos in this collection © Capitolshots Photography, ALL RIGHTS RESERVED. Please contact Capitolshots Photography at 202.709.7273 or at info@capitolshots.com if interested in licensing any of the images in this collection. Photos of the Mariposa County Courthouse in Mariposa, California. Designed by Perrin Fox and built in 1854, the Mariposa courthouse, a Greek Revival structure, is the oldest in California and possibly the oldest in continuous use west of the Mississippi. The Mariposa County Courthouse is listed on the National Register of Historic Places and is a California Historic Landmark. All photos in this collection © Capitolshots Photography, ALL RIGHTS RESERVED. Please contact Capitolshots Photography at 202.709.7273 or at info@capitolshots.com if interested in licensing any of the images in this collection. Photos of the Merced County Courthouse in Merced, California. Designed by Nacht %26 Lewis, the Merced courthouse was completed in 2007. All photos in this collection © Capitolshots Photography, ALL RIGHTS RESERVED. Please contact Capitolshots Photography at 202.709.7273 or at info@capitolshots.com if interested in licensing any of the images in this collection. Photos of the Monterey County Courthouse in Salinas, California. The Salinas courthouse was designed by Robert Stanton. The Monterey County Courthouse, a Moderne structure, was completed in 1937. All photos in this collection © Capitolshots Photography, ALL RIGHTS RESERVED. Please contact Capitolshots Photography at 202.709.7273 or at info@capitolshots.com if interested in licensing any of the images in this collection. Photos of the Napa County Courthouse in Napa, California. Designed by Samuel and Joseph Newsom and constructed in 1878, the Napa courthouse, an Italianate structure, is listed on the National Register of Historic Places. The building is still in use, although the county opened a new Napa County Courthouse across the street in 1998. All photos in this collection © Capitolshots Photography, ALL RIGHTS RESERVED. Please contact Capitolshots Photography at 202.709.7273 or at info@capitolshots.com if interested in licensing any of the images in this collection. Photos of the Nevada County Courthouse in Nevada City, California. Originally constructed in 1867, the Nevada City courthouse underwent expansion and renovation in 1900. It was drastically remodeled in 1936-37 by architect George Sellon, resulting in the existing WPA Moderne structure. An annex to the Nevada County Courthouse was constructed in the mid-1960s. All photos in this collection © Capitolshots Photography, ALL RIGHTS RESERVED. Please contact Capitolshots Photography at 202.709.7273 or at info@capitolshots.com if interested in licensing any of the images in this collection. Photos of the Orange County Courthouse in Santa Ana, California. The modern 11-story Santa Ana courthouse was designed by Richard Neutra. The Orange County Courthouse was completed in 1968. All photos in this collection © Capitolshots Photography, ALL RIGHTS RESERVED. Please contact Capitolshots Photography at 202.709.7273 or at info@capitolshots.com if interested in licensing any of the images in this collection. Photos of the Old Orange County Courthouse in Santa Ana, California. Designed by C.C. Strange and completed in 1901, the Romanesque Revival structure, built of red Arizona sandstone, served as the county's courthouse until a modern structure was completed nearby in 1968. The Santa Ana courthouse was closed in 1979 for safety reasons and was reopened in 1987 after a four-year restoration effort. Now a museum, the Old Orange County Courthouse is listed on the National Register of Historic Places and is a California Historical Landmark. All photos in this collection © Capitolshots Photography, ALL RIGHTS RESERVED. Please contact Capitolshots Photography at 202.709.7273 or at info@capitolshots.com if interested in licensing any of the images in this collection. 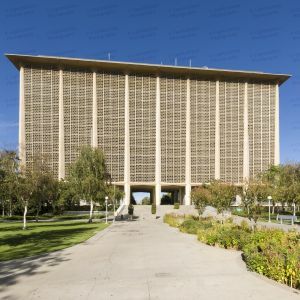 Photos of the Riverside County Courthouse in Riverside, California. Designed by the Los Angeles architectural firm of Burnham %26 Bliesner, the Riverside courthouse, a Beaux Arts structure was completed in 1904. The Riverside County Courthouse extensively renovated in the 1990s. All photos in this collection © Capitolshots Photography, ALL RIGHTS RESERVED. Please contact Capitolshots Photography at 202.709.7273 or at info@capitolshots.com if interested in licensing any of the images in this collection. Photos of the Riverside County Hall Of Justice (officially the Robert Presley Hall of Justice) in Riverside, California. The Riverside courthouse is adjacent to the older, historical Riverside County Courthouse and houses the county's adult criminal proceedings. 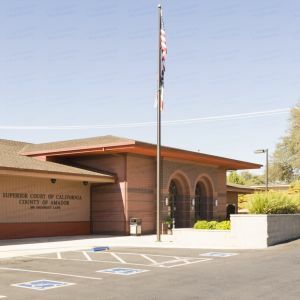 The Riverside County Hall Of Justice was designed by Clinton Marr %26 Associates and was built in 1991. All photos in this collection © Capitolshots Photography, ALL RIGHTS RESERVED. Please contact Capitolshots Photography at 202.709.7273 or at info@capitolshots.com if interested in licensing any of the images in this collection. Photos of the Gordon D. Schaber Sacramento County Courthouse in Sacramento, California. The Sacramento courthouse was completed in 1965. All photos in this collection © Capitolshots Photography, ALL RIGHTS RESERVED. Please contact Capitolshots Photography at 202.709.7273 or at info@capitolshots.com if interested in licensing any of the images in this collection. Photos of the former San Benito County Courthouse in Hollister, California. The Hollister courthouse was built in 1963. A new San Benito County Courthouse was completed in 2014. All photos in this collection © Capitolshots Photography, ALL RIGHTS RESERVED. Please contact Capitolshots Photography at 202.709.7273 or at info@capitolshots.com if interested in licensing any of the images in this collection. Photos of the San Bernardino County Courthouse in San Bernardino, California. Designed by Howard E. Jones, the San Bernardino courthouse was built in 1926. The Classical Revival San Bernardino County Courthouse is listed on the National Register of Historic Places. All photos in this collection © Capitolshots Photography, ALL RIGHTS RESERVED. Please contact Capitolshots Photography at 202.709.7273 or at info@capitolshots.com if interested in licensing any of the images in this collection. Photos of the San Diego County Courthouse in San Diego, California. The San Diego courthouse built in 1961. All photos in this collection © Capitolshots Photography, ALL RIGHTS RESERVED. Please contact Capitolshots Photography at 202.709.7273 or at info@capitolshots.com if interested in licensing any of the images in this collection. Photos of the San Diego County Hall Of Justice in San Diego, California. The San Diego courthouse was designed by Carrier Johnson Wu. The San Diego County Hall Of Justice was dedicated in 1996. All photos in this collection © Capitolshots Photography, ALL RIGHTS RESERVED. Please contact Capitolshots Photography at 202.709.7273 or at info@capitolshots.com if interested in licensing any of the images in this collection. Photos of the San Francisco Hall Of Justice (officially the Thomas J. Cahill Hall Of Justice) in San Francisco, California. The San Francisco courthouse, completed in 1960, not only is home to the criminal courts for the City and County of San Francisco but also is home for the San Francisco Police Department and Jail. All photos in this collection © Capitolshots Photography, ALL RIGHTS RESERVED. Please contact Capitolshots Photography at 202.709.7273 or at info@capitolshots.com if interested in licensing any of the images in this collection. Photos of the San Francisco Civic Center Courthouse in San Francisco, California. Designed by Ross Drulis Cusenbery Architecture, the San Francisco courthouse, built in 1998 and located just north of San Francisco City Hall, houses the civil courts for the City and County of San Francisco. All photos in this collection © Capitolshots Photography, ALL RIGHTS RESERVED. Please contact Capitolshots Photography at 202.709.7273 or at info@capitolshots.com if interested in licensing any of the images in this collection. Photos of the San Joaquin County Courthouse in Stockton, California. The Stockton courthouse was completed in 1964. All photos in this collection © Capitolshots Photography, ALL RIGHTS RESERVED. Please contact Capitolshots Photography at 202.709.7273 or at info@capitolshots.com if interested in licensing any of the images in this collection. Photos of the San Luis Obispo County Courthouse in San Luis Obispo, California. The San Luis Obispo courthouse was designed by A.R. Walker %26 P.A. Eisen. The San Luis Obispo County Courthouse, an Art Deco structure, was constructed in 1940. All photos in this collection © Capitolshots Photography, ALL RIGHTS RESERVED. Please contact Capitolshots Photography at 202.709.7273 or at info@capitolshots.com if interested in licensing any of the images in this collection. Photos of the historic San Mateo County Courthouse, now the San Mateo County History Museum, in Redwood City, California. The Redwood City courthouse, designed by Glenn Allen and dedicated in 1910, replaced a courthouse completed just before being mostly destroyed in the earthquake of 1906. The building was restored in the 1990s, and the county's historical association moved into the building in 1998. The historic San Mateo County Courthouse is listed on the National Register of Historic Places. All photos in this collection © Capitolshots Photography, ALL RIGHTS RESERVED. Please contact Capitolshots Photography at 202.709.7273 or at info@capitolshots.com if interested in licensing any of the images in this collection. Photos of the San Mateo County Hall Of Justice %26 Records in Redwood City, California. The Redwood City courthouse was built in 1955 and expanded in 1971. All photos in this collection © Capitolshots Photography, ALL RIGHTS RESERVED. Please contact Capitolshots Photography at 202.709.7273 or at info@capitolshots.com if interested in licensing any of the images in this collection. Photos of the Santa Barbara County Courthouse in Santa Barbara, California. Designed by William Mooser Company Architects, the Santa Barbara courthouse was completed in 1929. The Santa Barbara County Courthouse, a Spanish Colonial Revival structure, is a National Historic Landmark. All photos in this collection © Capitolshots Photography, ALL RIGHTS RESERVED. Please contact Capitolshots Photography at 202.709.7273 or at info@capitolshots.com if interested in licensing any of the images in this collection. Photos of the Santa Clara County Courthouse in San Jose, California. Designed by Levi Goodrich and built in 1868, the Renaissance Revival courthouse, the county's eighth, underwent significant renovations after a fire in 1931 destroyed the building's dome. A third story was also added to the San Jose courthouse after the fire. The Santa Clara County Courthouse is part of the St. James Park Historic District, which is listed on the National Register of Historic Places. All photos in this collection © Capitolshots Photography, ALL RIGHTS RESERVED. Please contact Capitolshots Photography at 202.709.7273 or at info@capitolshots.com if interested in licensing any of the images in this collection. Photos of the Santa Clara County Hall Of Justice in San Jose, California. Located in the civic center complex north of downtown, the San Jose courthouse, designed by Hoover Associates and Hellmuth Obata %26 Kassabaum, Inc., was completed in 1991 and provided 19 additional courtrooms for the county. Design flaws led the county to sue the architects and general contractor of the Santa Clara County Hall Of Justice. All photos in this collection © Capitolshots Photography, ALL RIGHTS RESERVED. Please contact Capitolshots Photography at 202.709.7273 or at info@capitolshots.com if interested in licensing any of the images in this collection. Photos of the Santa Clara Superior Court in San Jose, California. Adjacent to the historic 1866 Santa Clara County Courthouse, the modern brick San Jose courthouse was built in 1964. All photos in this collection © Capitolshots Photography, ALL RIGHTS RESERVED. Please contact Capitolshots Photography at 202.709.7273 or at info@capitolshots.com if interested in licensing any of the images in this collection. Photos of the Santa Cruz County Courthouse in Santa Cruz, California. The one-story concrete Brutalist Santa Cruz courthouse, built in 1967, is connected to the county's five-story administration building as part of the Santa Cruz County Governmental Complex. All photos in this collection © Capitolshots Photography, ALL RIGHTS RESERVED. Please contact Capitolshots Photography at 202.709.7273 or at info@capitolshots.com if interested in licensing any of the images in this collection. Photos of the Sonoma County Hall Of Justice, the Sonoma County courthouse, in Santa Rosa, California. The Santa Rosa courthouse was built in the 1960s. All photos in this collection © Capitolshots Photography, ALL RIGHTS RESERVED. Please contact Capitolshots Photography at 202.709.7273 or at info@capitolshots.com if interested in licensing any of the images in this collection. Photos of the Stanislaus County Courthouse in Modesto, California. The Modesto courthouse was designed by Mitchell Van Bourg %26 Associates. The Stanislaus County Courthouse was constructed in 1960. All photos in this collection © Capitolshots Photography, ALL RIGHTS RESERVED. Please contact Capitolshots Photography at 202.709.7273 or at info@capitolshots.com if interested in licensing any of the images in this collection. 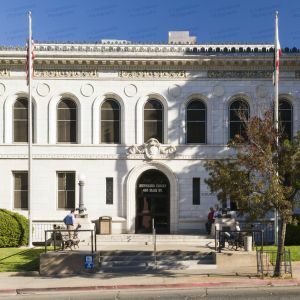 Photos of the Tulare County Courthouse %26 County Offices in Visalia, California. The Visalia courthouse was designed by David H. Horn, Marshall D. Mortland and Richard P. Clark. The Tulare County Courthouse was constructed in 1957. All photos in this collection © Capitolshots Photography, ALL RIGHTS RESERVED. Please contact Capitolshots Photography at 202.709.7273 or at info@capitolshots.com if interested in licensing any of the images in this collection. Photos of the Tuolumne County Courthouse in Sonora, California. The brick Sonora courthouse, designed by William Mooser %26 Son, was built in 1898. The Tuolumne County Courthouse is listed on the National Register of Historic Places. All photos in this collection © Capitolshots Photography, ALL RIGHTS RESERVED. Please contact Capitolshots Photography at 202.709.7273 or at info@capitolshots.com if interested in licensing any of the images in this collection. 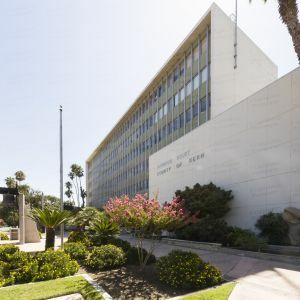 Photos of the Ventura County Hall Of Justice in Ventura, California. The Ventura courthouse is part of the Ventura County Government Center, which opened in 1978. All photos in this collection © Capitolshots Photography, ALL RIGHTS RESERVED. Please contact Capitolshots Photography at 202.709.7273 or at info@capitolshots.com if interested in licensing any of the images in this collection. Photos of Ventura City Hall, formerly the Ventura County Courthouse, in Ventura, California. Designed by Albert C. Martin and completed in 1912, the Neoclassical structure served as the Ventura County Courthouse until concerns about safety led the county to abandon it after an earthquake in 1968. The City of Ventura purchased and restored the building, which it now uses as its city hall. Ventura City Hall is listed on the National Register of Historic Places and is a California Historical Landmark. All photos in this collection © Capitolshots Photography, ALL RIGHTS RESERVED. Please contact Capitolshots Photography at 202.709.7273 or at info@capitolshots.com if interested in licensing any of the images in this collection. Photos of the Yolo County Courthouse in Woodland, California. Designed by William Henry Weeks, the Woodland courthouse was constructed in 1917. The Yolo County Courthouse, a sandstone Classical Revival structure, is listed on the National Register of Historic Places. All photos in this collection © Capitolshots Photography, ALL RIGHTS RESERVED. Please contact Capitolshots Photography at 202.709.7273 or at info@capitolshots.com if interested in licensing any of the images in this collection. 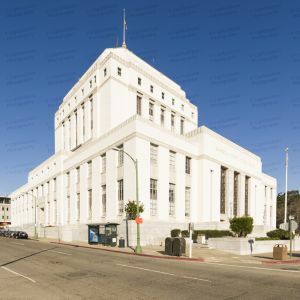 Royalty-free licenses are available for all of Capitolshots Photography’s photos of California courthouses (without the watermarks, of course). You may email us if you are interested in licensing any image, which are available at several sizes, from 72-dpi web-quality JPGs all the way up to TIF files. You may also visit our ordering page for additional information. Looking for prints of California county courthouses? Our images work great for decorative art, presentations, office decor and gifts. All sizes available (without the watermarks). You may email us if you are interested in purchasing a print. You may also visit our ordering page for additional information. Click on any of the galleries of California courthouses above to view the images for each courthouse. The file name, which you will need to place your order, will be at the beginning of the caption underneath each image after enlargement.